Religious prohibitionist President Benjamin Harrison was defeated November 8 of 1892. Prohibition Party candidates claimed an astounding 2.2% of the popular vote, and three (03) “People’s Party” socialists were elected to Congress with 8.5% of the vote. 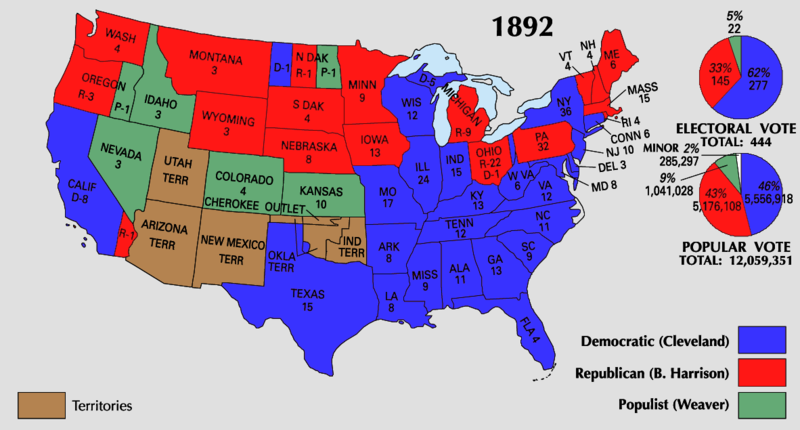 By Inauguration Day the Panic of 1893 already gripped the land. Banks failed everywhere and businesses went bankrupt. Why? Barely a year later economic collapse was complete and a tariff bill incorporating an income tax was argued before the Senate. This is what 8.5% of the popular vote and three looter politicians can accomplish against a background of increasing agitation for the ideal of a socialized workers’ paradise in America. This agitation which had begun with the 1850 publication of the Communist Manifesto in English, by June of 1892 had grafted the income tax plank onto the People’s Party platform. The day Cleveland turned the tables on his Republican prohibitionist adversary, French communist Émile Henry planted a bomb, killing 5, and the penultimate installment of A Traveler from Altruria appeared in Cosmopolitan Magazine. Before the Soviet revolution and Germany’s Christian National Socialist movement revealed the genocidal features of socialism, especially in its communo-fascist variants, all manner of idealists young and old were fascinated by the promise of utopias to come–if only taxation and coercion were to replace the voluntary exchange of goods and services through the use of money. Socialists and conservatives shouting at each other were daily fare in the German Reichstag in 1893. Yes prohibitionism and racial collectivism were everywhere afoot. A humiliating 1882 Chinese Exclusion law had just been renewed, frightening immigrants and irritating Chinese corporations. Though opium was legal, the opium tariff (10% of all customs revenue) was high enough to encourage smuggling through British Canada in customs-sealed railroad cars. Dry lame duck President Harrison in February 1893, a month before Inauguration Day, tinkered with regulations so as to put a stop to railcar opium smuggling. Newspapers suddenly bristled with stories of opium evils. Economic problems in the Pacific Northwest followed immediately. Tong war gunfire announced an opium famine among Highbinders in Chinatowns nationwide within two weeks. Neither the Democratic nor the Republican platform called for an income tax, but William Jennings Bryan and Benton McMillin leapt onto the Populist bandwagon headed for Altruria, agitating shrilly for an income tax in the spring of 1893. The depression deepened as more and more Democrats in Congress backed that particular tax. That 9% vote packed the law-changing clout of a better than 51% mandate. It’s as though each People’s Party platform spoiler vote were worth six votes squandered on kleptocracy candidates. That’s leverage! The grinning mask of socialism has since fallen away to reveal a death’s-head. Its empires of torture collapsed in 1991 and fugitive victims are everywhere bearing witness to a legacy of murder and slavery shameful even by the standards of metropolis-colony Mercantilism. Nobody wants to move to Cuba, Venezuela, China or North Korea. Nobody reads Howell, Bellamy, Marx or London, but rather Ayn Rand, Robert Heinlein, Milton Friedman and Neil Stephenson. Today it is the mask of mixed-economy mercantilism that is slipping. The violence of mystical prohibitionism and Kleptocracy now cringes in anticipation of a hitherto unknown and never-experienced ideal of libertarian choice in government. The message from our historical past is that 8.5% of the popular vote and 3 new congressmen did indeed produce huge changes in American politics. When the changes favored looting, as in 1892 and 2004, the results were disastrous. But whenever change favors political and economic freedom, the results are enviable. Remember that one spoiler vote is worth 6 to 36 regular votes (mean value =21) when it comes to repealing bad laws and reducing taxes. Remember Portugueseinterpreter.com if you ever need a simultaneous interpreter tempered by war and real-time MBA lecture course interpreting at UT Austin.